I've been promising this post for awhile, and now it's finally here. I just got married on Friday, and I did my own makeup. If you follow me on Instagram, you'll know I had quite the journey of figuring out everything I'd wear and what kind of look I'd do for the day. After a few trials and a lt of practice, I think everything went off without a hitch. 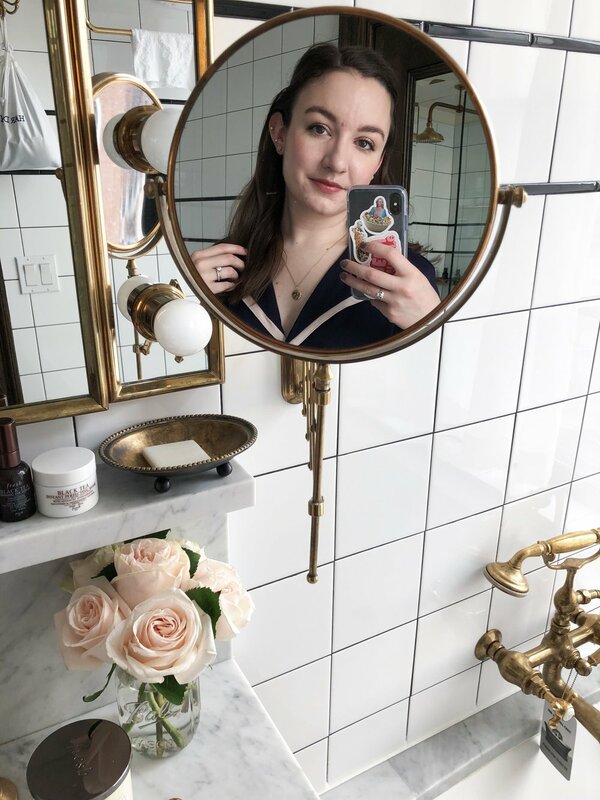 I started off with freshly washed and moisturized skin (let me know if you want a post on the skincare I was using in the lead-up to the wedding, too!) and applied a base layer of the Smashbox Photo Finish Primerizer. I never used to be a primer gal, but this one truly changed me. It sinks right into the skin but plumps up and hydrates it, which for me is key for getting my makeup to stay in place. I found my perfect foundation rather early in this whole process, and it was actually a mixture of two - I mixed equal parts Giorgio Armani Luminous Silk Foundation with the Koh Gen Do Aqua Foundation (which has since been reformulated - I still used the old version). This combo gave me the perfect amount of luminosity, a skinlike finish, and great longevity. It lasted all night long. For concealer I went in and covered up any lingering patches of redness with the Milk Makeup Flex Concealer, which is my ultimate favorite. I love it so much that I couldn't even think of another one to even try when doing my makeup trials. Since it doesn't fully cover my acne scars, I took it a step further and spot concealed with the Kevyn Aucoin Sensual Skin Enhancer. For my cheeks, I layered cream and powder products for optimum longevity. I started with a base of the Glossier Cloud Paints* in Dusk and Puff, using Dusk in places where I'd bronze and contour, and Puff on the apples of my cheeks where I was going to apply blush. I also used the Charlotte Tilbury Beauty Light Wand as an initial layer of highlight - this is one of the prettiest highlighters I own, so I had to make use of it on the day. As for powders, I contoured with a bit of the Surratt Beauty Artistique Blush in Grisaille, which is a beautiful cool-toned brown in an easy-to-use, buildable formula. I also went for a Surratt Artistique Blush as my blush shade, dipping into La Vie En Rose - I almost went for a lighter shade, but I'm glad I chose something a little deeper that stood out in photos. To blend together the blush and contour, I added a bit of the Guerlain Terracotta Sun Trio Bronzer. Then I dusted a bit of the Laura Mercier Matte Radiance Baked Powder in 01 Highlight on the tops of my cheekbones and browbones - this is probably the best highlight for brides. It's super subtle and gives you a lit-from-within glow. I finished off the skin with a veil of the Charlotte Tilbury Airbrush Flawless Finish Powder through the center of my face. I knew I wanted a more feathered, less blocky brow look, so I started with a layer of the Glossier Boy Brow in Brown and followed it with the MAC Eyebrows Styler in Stylized. * I only just got the brow pencil last week, but I instantly fell for the formula and application. It's waterproof, and it lasted all night without smudging. For my eyes, I was feeling a slight rose gold look, but I also wanted to throw in some cool tones since they're more flattering on my skin. To combine those two things together, I used the Glossier Lidstar in Cub as the base for my eyeshadows - it not only gave my whole eyeshadow look a more rose-gold hue, but also worked beautifully as an eyeshadow primer and kept what I put on top from creasing all night. I went in on top with MAC Eyeshadows, dipping into the Cool Neutrals x15 Palette and a custom palette my sister made from me - I used mostly Quarry, Cork, and Naked Lunch from there. For a little extra sparkle, I patted a bit of the Dior Fusion Mono Eyeshadow in Chimiere on the center of my eyelids. Rather than a harsh liquid line for eyeliner, which I don't feel is very flattering on me, I did a soft smoky wedge using the Colourpop Eyeliner in Brew-Haha topped with a dark brown shadow from the MAC Cool palette. For mascara I went a bit rogue, choosing to layer two formulas, neither of which was waterproof. I started with a layer of the Milk Makeup Kush Mascara because I just love how it makes me look like I have dramatic lash extensions - it makes them look super fluffy, fanned out, and voluminous. Then on top I combed through some Glossier Lash Slick to help separate any clumps, lengthen, and keep it from smudging. The longevity of these two blew me away - I was actually afraid I'd have to do an emergency waterproof mascara run the morning of the wedding, but these two ended up holding up perfectly, even when my husband broke down in tears during his vows, which made me cry a lot. The mascara didn't smudge at all throughout the night, holding up from about 2pm to 3am. The last thing to apply was lipstick, and again, if you follow me on Instagram, you'll know what a dilemma I was having - I attach a lot of sentimental value to lipsticks, so I kind of wanted a new one that I could forever remember as my "wedding lipstick." But I also wanted to wear something I knew I liked and would hold up well. In the end I found a compromise - I went with a Bobbi Brown Lipstick, which I knew was a formula that worked well for me, but I picked up a new shade, Sandwash Pink. It's such a perfect, classic neutral pink. I hear it's the one Kate Middleton wore for her wedding, which is what made me make a beeline for it when I went to Sephora with my sister for this quest for a wedding lipstick. It worked out so perfectly and is now my new favorite lipstick. I layered the Charlotte Tilbury Lip Cheat in Pillow Talk underneath of course, and for the reception I topped it with the Lancome L'Absolu Lacquer in Infra Rose for something a little more fun - the shade looked lovely over Sandwash Pink, and it added a beautiful gloss that stayed put really well. I definitely need to run out and buy more shades now, because the formula is phenomenal. So that's it! Everything I wore on my face for my wedding. What are your favorite makeup picks for special occasions? And are you with me on the wedding lipstick thing? Products marked with an asterisk (*) were sent to me for consideration, but all opinions are my own. This post contains affiliate links.